The unexpected literary rivalry spawned by Sunday’s Mike Pence-focused episode of Last Week Tonight is getting heated. 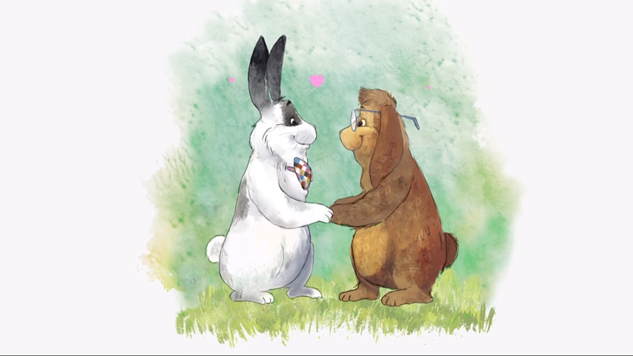 On the eve of the release of a book focused on the one redeeming quality of Pence, the family’s pet bunny Marlon Bundo, John Oliver announced the immediate release of his show’s own book about Bundo falling in love with a fellow boy bunny. Overnight, A Day in the Life of Marlon Bundo, written by Last Week Tonight writer Jill Twiss, landed at the top of Amazon’s Best Sellers list, where it currently remains, while Marlon Bundo’s A Day in the Life of the Vice President, written by the VP’s daughter, Charlotte, and illustrated by his wife, Karen, currently sits at fourth on the list. Twiss’ children’s book that introduces children to the love-is-love message is both beautiful and gratifying in its ability to irk the Vice President and his family, who have long been staunch opponents of the queer community. Pence has been linked to prominent evangelical figures, such as Focus on the Family founder Dr. James Dobson, who advocate for gay conversion therapy, and he introduced religious liberty laws during his tenure as governor of Indiana that allowed businesses to discriminate based on sexual orientation. Regnery Publishing, the publishers of the Pences’ Bundo book, expressed disappointment that the conversation around their simple book about a bunny became so politicized. “It’s unfortunate that anyone would feel the need to ridicule an educational children’s book and turn it into something controversial and partisan,” said a Regnery Publishing spokesperson in a statement to CNN. The publishers complaints about partisanship are likely to fall on deaf ears, seeing as the company’s slogan is “The Leader in Conservative Books.” Regardless, it’s understandable to be frustrated when something you worked so long and hard to put together gets undercut at the last minute by a cultural force you don’t believe should impact your work. Just ask the litany of LGBT advocates who have fought against the kind of discrimination Pence has preached throughout his political career. They’ll let you know all about that feeling. A Day in the Life of Marlon Bundo stands as one of the better inventive responses crafted by the minds at Last Week Tonight, and it looks to have some serious staying power. It also helps that all proceeds from the sale of the children’s book will be donated to The Trevor Project and AIDS United. Revisit Oliver’s Pence story here.